Welcome to "Kiara". 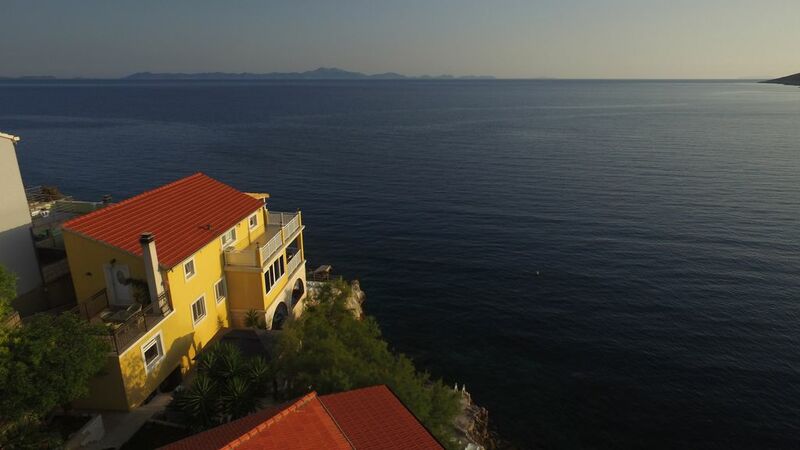 Positioned on a small incline right on the water just steps to the water and a "SPECTACULAR¨ view from our balcony overlooking the crystal clear sea and the island of Lastovo, Susac and the Zavalatica bay. With concrete stone slabs and beach lounge chairs you can relax and enjoy the hot summer sun and the afternoon fresh sea breeze. Close by is a sandy/pebble beach Zitna behind the Zavalatica bay. The apartment has an A/C, fans, mosquito net window covers, 2 queen size bedrooms with night tables, desks, wall to wall closets, flat TV, 1 bathroom with sink and tub. Open kitchen with extended counter top, utensils, kitchenware, wine glasses, microwave, coffee maker, tea kettle, toaster, blender, dishwasher, cooktop, oven and fridge with water filter and ice maker. Dining room with large table for 6. Living room with a flat TV, couch and sofa chair. Towels, linens and beach towels will be provided as well as toiletries; shampoo, conditioner, body wash, soap, hair dryer, flat iron. The large wall to wall closet is supplied with first-aid kit and fire extinguisher, cleaning supplies, iron and board and some food supplies. A complimentary meal will be served for our guest upon arrival. Pickup and drop-off from one of our main ports on the island can be arranged with notice. Nelly is a great and very friendly host. The appartment is really great and we missed nothing. The view from the terrace is marvelous. You can see the fish swimming in the sea from it. That was holiday as it should be. There are a restaurant, a Cafe nearby and a supermaket nearby so it's not necessary to have a car.